I hear more and more that the library is the hub of learning in the school. I’m not convinced that I know exactly what that means when I hear it, but I certainly hear it often enough. If we take this as true, then we need to look at what kind of learning the library is the hub of. Traditionally, it has been the hub of learning, because, in an age of scarcity of information, you had to come to the library to “get knowledge.” The reality is that you’d read books to get information so that you could form understanding of concepts. In a pre-consumer culture, there was no illusion that this was a process that involved work. You didn’t simply open up your brain and dump the information in, you had to work with concepts to make them your own. With access to information becoming at one’s finger tips, not only do you not need to go to the library to get information, the ease of access promotes a consumer approach to gaining knowledge. Watch the DIY video on YouTube and you “know” how to do something. For simple tasks or concepts, there is a lot of truth to this, but it doesn’t take too much to add a twist or layer of complexity and you have to start working with that knowledge. This is where Bloom comes in. 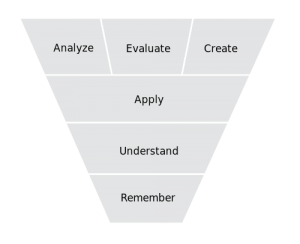 I won’t spend time explaining Bloom, but his taxonomy is widely regarded by current educators to have a fair amount of truth to it. Reading is different than working through a problem. Reading hopefully involves remembering and understanding and is often an important precursor to being able to apply new knowledge to a different scenario. The act of analyzing, evaluating and creating requires an ability to apply the new knowledge. Libraries of old were limited to lower cognitive domains. If you were learning how to build a bridge, you weren’t going to tear down the stacks in order to actually construct that bridge. At best, you could diagram or imagine how the knowledge you were developing through reading might be applied at a later date. Technology is shifting this concept. Libraries don’t have to devote themselves to miles of shelving in order to be able to cater to the potential information needs of its users. One computer easily gives access to far more information than a room full of great books could ever house. With the prevalence of mobile technology, there may not even be a need for the one computer! With the physical space restriction lifted or at least significantly reduced, school libraries can start to address the higher cognitive levels of Bloom’s Taxonomy with a vengeance. Here, libraries or learning commons can offer the traditional access to resources in a space that encourages the application of newly forming knowledge through creation, evaluation and analyzation. This is where the coffee tables are positioned for discourse around ideas and makerspaces are developed for users to create artifacts that apply their developing knowledge. Here is where we need to start putting together digital media labs and 3D modelling centres where students not only can imagine how ideas go together but can build them to actually see if their ideas will work. Makerspaces and other means of constructivist knowledge building are not just cool new trendy things if we really believe that libraries are the hub of learning in a school. They are essential to the learning process and a natural extension of the role that libraries have always played. Technology is enabling us to reduce the physical footprint of our book stacks – note: reduce, not eliminate – to make room for deeper learning. Technology is also enabling the learners to apply their new knowledge in more tactile ways. 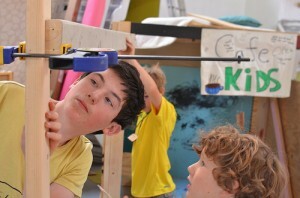 While we may not have a student actually build that bridge in the library space, certainly the ability to construct a model with balsa wood or 3D modelling (whether the model remains digital or is then transferred into the physical realm through 3D printing) is a reality and needs to be available. Why the library and not in the classroom? Because the library is the hub. It is the only truly cross-discipline space that is available to all potential users. OK, this makes sense to me but it may be simply be a justification for beliefs I already hold or want to hold. I have inherited strong justification skills from my parents so I’m willing to concede that I may be missing some key points here. As I said before, this is simply an attempt to work through this argument and I would truly appreciate anyone poking holes in it. Over to you! “then we need to look at what kind of learning the library is the hub of” leads the kind of response because I believe the kind of learning is driven by the school culture and the kind of hub is the proportional relationship of the library team and their assets and vision. The hub does not work in a vacuum nor does a strong learning school culture thrive without spirited and valued support services including the library program. I agree fully, Al! If the library is the hub, the hub depends on having connections to all aspects of the school curriculum and culture.